We produce organic Gouda cheese from milk delivered by cows, goats and sheep. In order to get 1 kilogram of cheese, we need about 10 litres of cow's milk, 9½ litres of goat's milk or 6 litres of sheep's milk. Milk contains proteins, minerals and fats. By extracting the moisture from these ingredients, cheese arises. 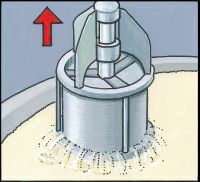 In a first step rennet and lactic starter are added to the milk; this causes the proteins to clott. 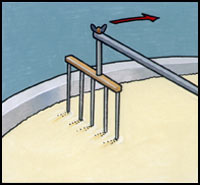 The lactic starter also results in a longer sustainability of the cheese and gives taste to the cheese. 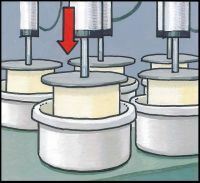 The curd is cut, resulting in small balls floating in moisture. The cutting occurs at even heating till about 35 degrees Celcius. The heating causes even more secretion of moisture from the curd balls. The whey contains many nutrients as milk sugars (lactose), minerals and fat, and is therefore often used for animal feed, but also for ice cream, soft drinks and cookies. 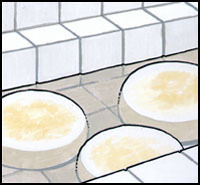 The curd balls are put together in cheese drums after which, during several hours, the last fluids are pressed out. 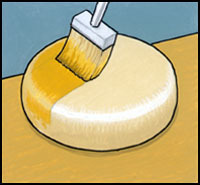 The drum shape, in combination with the high pressure, realises the cheese shape. A compact substance remains where still some air bubbles can exist which explain the holes in some cheese. 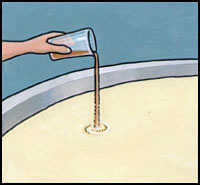 After pressing, the compact curd substance is removed from the drums and placed in a brine bath. A brine bath has a very high salt concentration. The salt partially gets into the cheese, thereby defining the taste. The brine causes the cheese to become more sturdy, realises outer crust forming and increases sustainability. The final shape is now there but the cheese is still soft and without crust. It takes at least 4 weeks for the cheese to mature in a temperature and humidity controlled storage. Also a coating is put in place to minimise dehydration and mould. In order to maintain shape, the cheese have to be turned around regularly. After ripening, the cheese gets the name belonging to its age; for example "young", "mature" and "old".